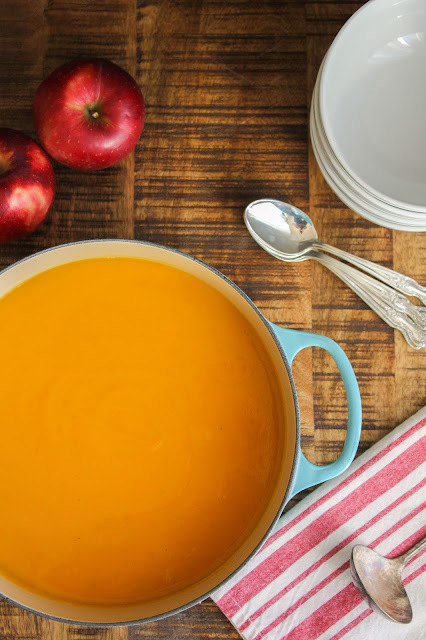 This smooth and silky sweet potato and apple soup makes a warm and comforting meal! 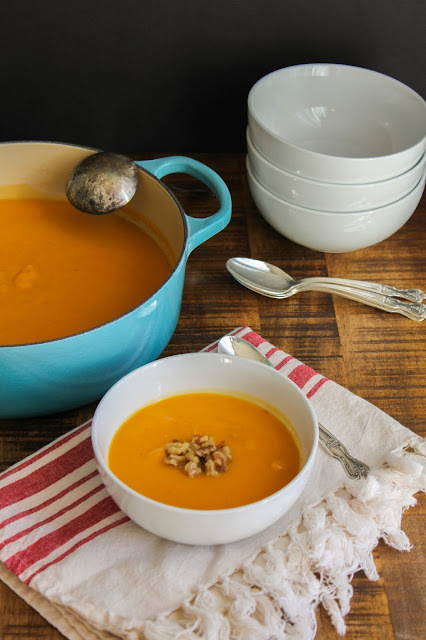 I eat soup pretty much all year round, but I absolutely love it in the fall and winter. There is nothing better than making a pot of homemade soup and the aromas it fills the house with. From French onion to creamy tomato to cheesy broccoli, I've cooked a lot of soups over the years, and I certainly have my favorites. 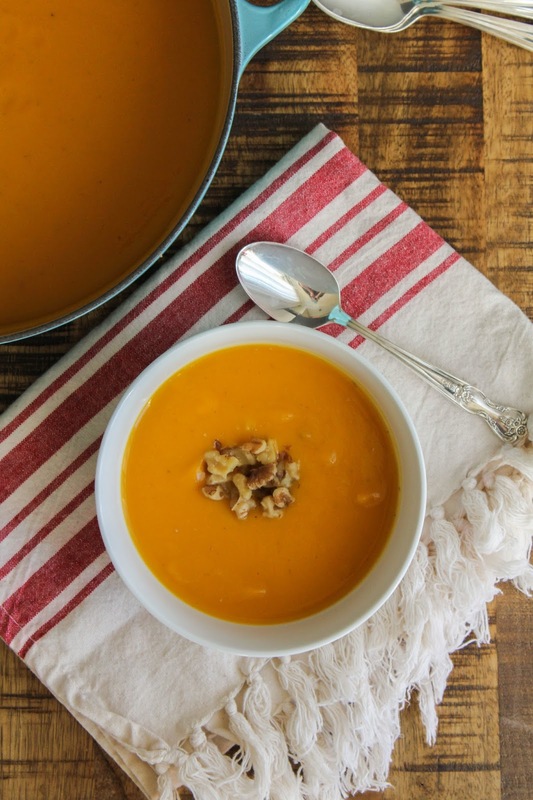 I've had butternut squash and apple soup before in a restaurant, but never made it at home. I decided to give it a try recently and make my own, but I gave my recipe a twist by using sweet potatoes instead of squash. I love sweet potatoes and thought they would be a perfect pairing with fresh apple and some nutmeg, and boy was I right! The soup is absolutely delicious and was quickly devoured by my entire family. 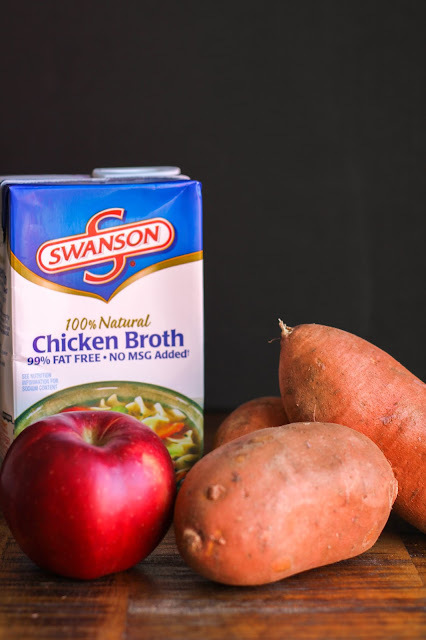 I use Swanson broths in most of my cooking, and the Swanson 100% Natural Chicken Broth was perfect for this soup. It gave it more flavor and more depth, which is just what I was looking for. The soup is warm and comforting and goes great with a slice or two of toasted baguette. I also like to top each individual bowl with a few chopped walnuts. They add a great crunch, and are also full of antioxidants which are good for brain and heart health. So what are you waiting for? Let's make some soup! Heat the oil in a Dutch oven or large pot over medium-high heat. Add the onion, salt, and pepper and cook, stirring occasionally, until tender and translucent, about 6 minutes. Add the sweet potatoes, apple, broth, water and nutmeg and bring to a boil. Turn the heat down to simmer and cook, covered, until the potatoes are tender, about 15 minutes. Ladle the soup into bowls and top with chopped walnuts, if desired. For more recipes and information about Campbell's, click here! What recipe are you most excited about making? You can find everything you need for this soup in your local Walmart store! They carry the full line of Swanson broths and stocks, which are located in the Soup aisle.